Many of you may assume that boots are only reserved for the fall and winter months. However, that's not always the case. 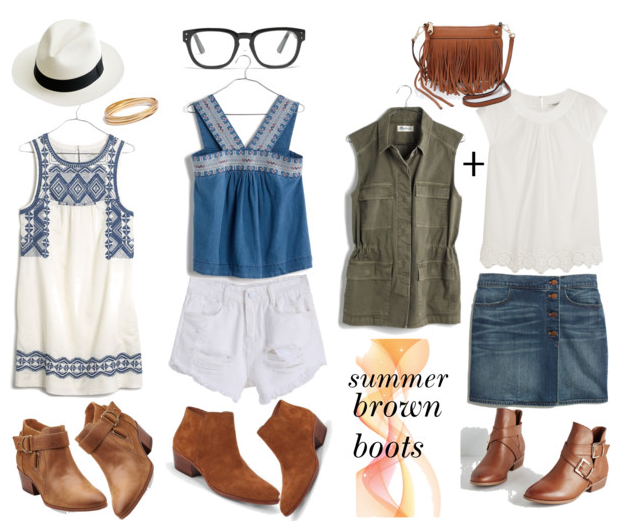 I like to pull out my boots and style it with my summer outfits for a more "trendy" look. You can find more brown flat boots here. It's also a great way to "remix" your wardrobe, if you're stuck in a wardrobe rut. I'm kinda sorta having a Madewell obsession right now. I'm swooning over these Madewell tops here + Madewell dresses here. P.S. don't forget to enter my Lilly Pulitzer agenda giveaway in yesterday's post!